Democratization of design and production is a fascinating area I have been keeping an eye on for over a decade now. 3D printing seems to be getting a lot of press lately. The next decade should get really interesting. This talk reminds of me of the old Sears mail-order houses. Sears used to sell houses in a catalog. The buyer would essentially get a giant kit to put together (sort of like Ikea furniture except a bit larger). 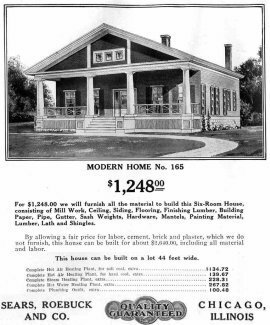 Sears Catalog Homes (sold as Sears Modern Homes) were ready-to-assemble kit houses sold through mail order by Sears, Roebuck and Company, an American retailer. More than 70,000 of these were sold in North America between 1908 and 1940.Shipped via railroad boxcars, these kits included all the materials needed to build a house. Many were assembled by the new homeowner and friends, relatives, and neighbors, in a fashion similar to the traditional barn-raisings of farming families.